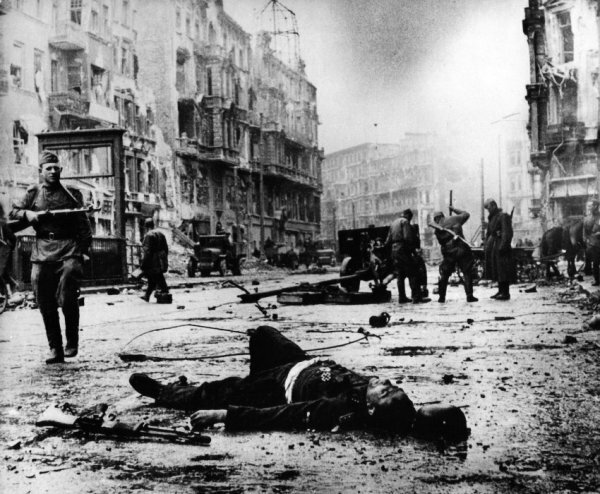 Red Army photographer Yevgeny Khaldei captured this photo of a typical Berlin intersection in May 1945. 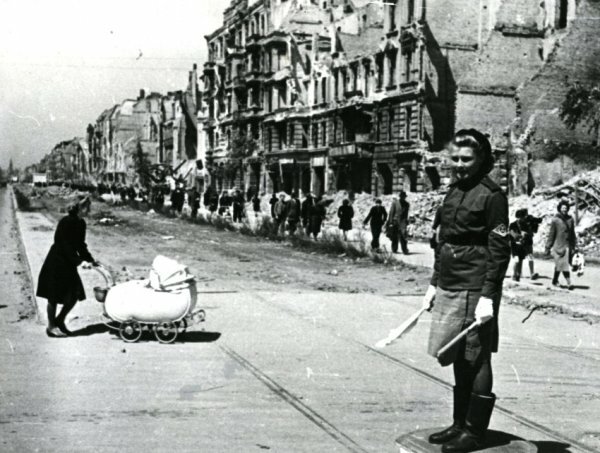 A female Soviet soldier is controlling traffic as a German mother crosses the street. Decades forgotten trove of post-war photographs from 1945 has recently been unearthed. The snapshots illustrate the devastation of the German capital and capture the desperation of the city in the weeks after the end of World War II. They also show glimpses of Berlin’s resilience. For decades these pictures, along with thousands of others, lay in the archives of a Berlin publishing house. Unnoticed. It is only now that the collection has come to light. The pictures capture a moment in the city that had reached the end of 12 years of dictatorship and a devastating war: Signs of those final battles, of death, destruction and hopelessness — but also of life growing once again among the ruins. A woman waters her balcony garden, a matter of survival in the starving city. The prints fill whole cabinets, endless shelves, countless boxes and files. Few journalists ever visit the photo archive on the first floor of the publishing house on Alexanderplatz. But these photos came to light when photo editor Peter Kroh started working on a book project his publishing house gave him. 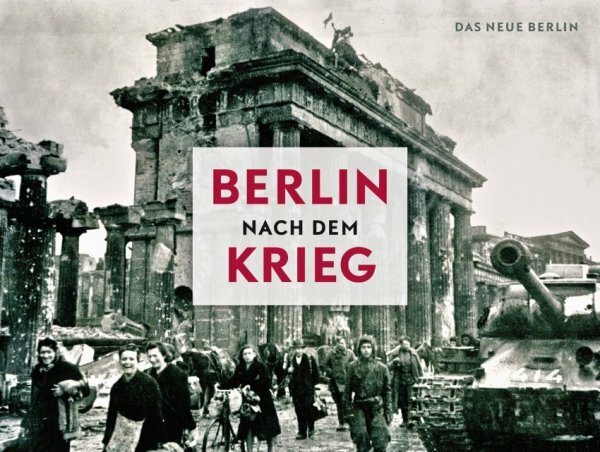 The book, entitled “Berlin After the War,” is being published to mark the 65th anniversary of Nazi Germany’s surrender. Red Army soldiers gather under shadows of tank barrels and the bombed-out Brandenburg Gate for a poetry reading. Suicide rates skyrocketed. Many of the people who killed themselves were women, afraid of Soviet soldiers or homelessness for the first time. A fallen soldier on the streets of Berlin. Pinned to his uniform is the Iron Cross. Berlin still strewn with remnants of the struggle for possession of the city in the spring of 1945. 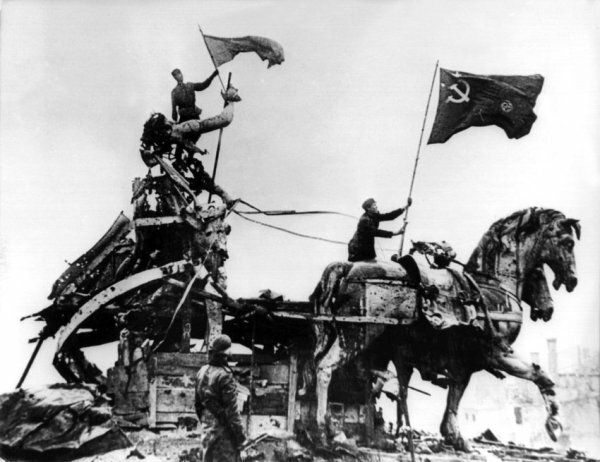 Proud Red Army soldiers hoisting flags over the Quadriga statue on the Brandenburg Gate. 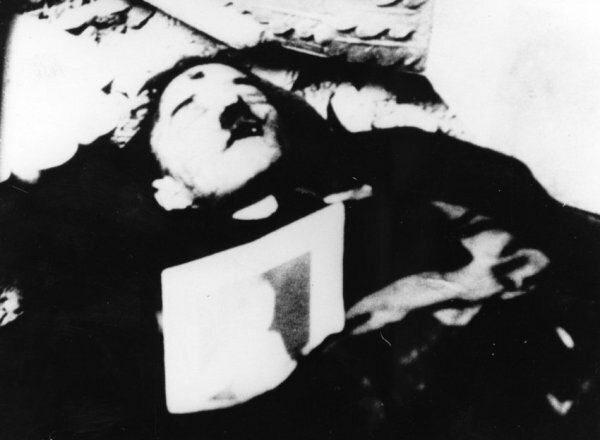 “The corpse A.H.,” not much is known about this photo. Dozens of copies were found in the archive, which suggests it was a Soviet propaganda shot. Desperate Berliners cut meat from a dead horse in the days after the war’s end. 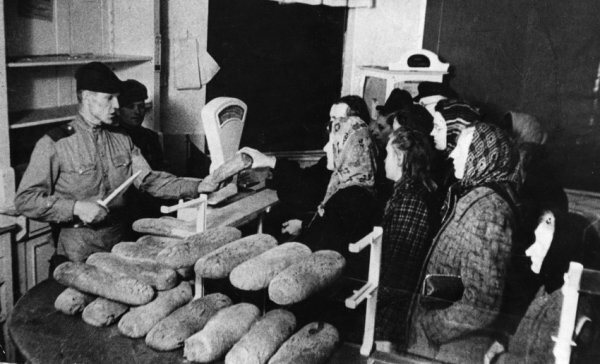 A Soviet soldier uses a German officer’s dagger to cut bread given to German women in post-war Berlin. 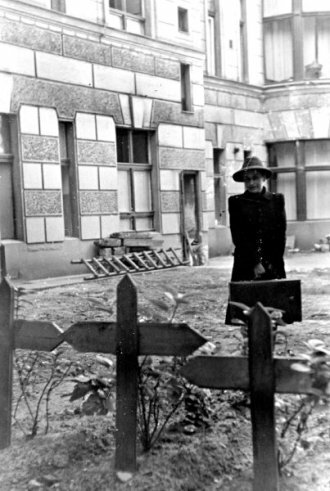 A refugee finds the graves of her family. Berlin children used the shell of this food drop “bomb” to make an improvised kayak. 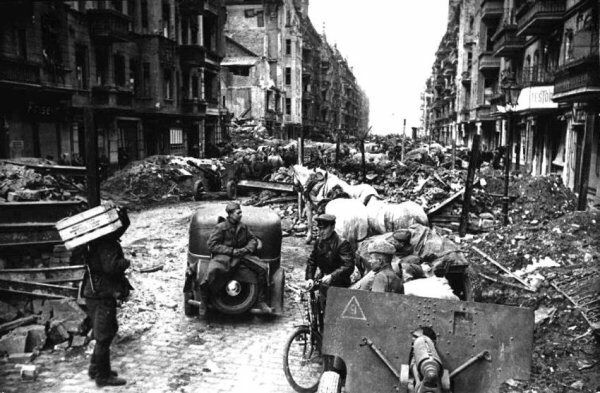 The streets of Berlin were choked with rubble — and Red Army soldiers — after the city’s capture. A couple walks down Dircksenstr., in the center of Berlin. The burning building behind them was nothing special in the chaotic days at the end of the war. Wounded German soldiers line Unter den Linden, Berlin’s main boulevard, as nurses struggle to help them. 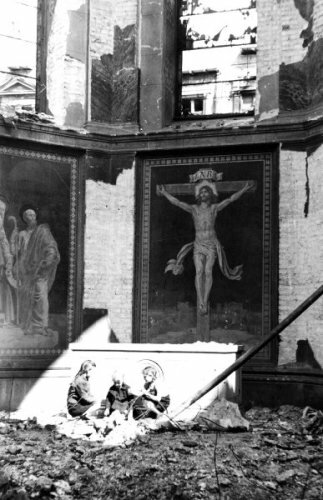 Photographer Otto Donath focused on everyday scenes, like these children playing in a bombed-out church. After the city’s surrender, Allied forces quickly took control. 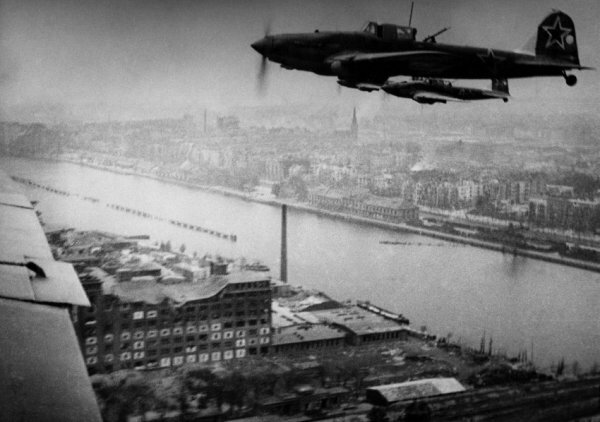 Here, a Soviet fighter plane soars over the Spree river.